An unclaimed property due diligence letter is an organization’s last chance at contacting an apparent owner and preventing their property from escheatment. Each state or reporting jurisdiction has its own unique set of due diligence requirements and standards. Due diligence letters are typically required to be sent 30 to 120 days before the report date and include a header warning, unique identifier and property amount, deadline to take action, post-escheat statement, owner disposition options, change of address form, owner verification requirements and holder contact information.  Because unclaimed property due diligence processes vary both by state and property type, creating and maintaining an effective process for managing it isn’t easy. There are currently 55 escheat reporting jurisdictions and more than 100 types of unclaimed property that require due diligence mailings including uncashed vendor and payroll checks, escrow balances, accounts receivable credit balances, overpayments, unidentified remittances, unredeemed gift cards, rebates, health and welfare plans, self-insured benefit plan payments, stocks, bonds and dividends. As not every organization has the resources or the infrastructure to support these mandatory owner outreach mailings, Keane provides comprehensive outsourced unclaimed property due diligence services that allows your company to focus on the business of keeping your company running. We address the complex and continually evolving state requirements associated with due diligence. We manage the set-up, merging, formatting, and mailing of all required due diligence letters, as well as answer customer responses from within our unclaimed property call center. In addition to helping your company with each state’s mandatory annual letter campaign, our team will help you put the processes in place for ongoing unclaimed property management. Our due diligence services are designed to routinely locate lost owners, are scalable, and accommodate state-specific requirements and delivery methods, such as certified mailings. By utilizing Keane’s unclaimed property due diligence programs, you will ultimately save your company time, money and resources – while keeping your records organized when it’s time to file your annual unclaimed property escheat reports. Don’t Wait Until Due Diligence Mailings Are Due – Be Proactive. Most states require companies to perform owner outreach efforts to property owners after the dormancy period has elapsed – usually three to five years after the payment or credit was originally generated. At this point, due diligence letters are simply notifications mailed to owners informing them that their property is in danger of escheating to the state of last known residence. However, by performing owner outreach efforts or research early in the process (for example, when checks have been outstanding for six months) you are better positioned to locate property owners and reunite them with their funds. As a result, less dormant property is generated and helps you save money on both returned mail and servicing inactive accounts and property. Each state has their own unique due diligence requirements and regulations that holders must follow. These state-specific nuances may include particular language, font sizes, value thresholds, and mailing methods. Keane has compiled a library of state due diligence laws as a way to easily review these requirements and ensure compliance. If you are interested in more information about our services or have any questions, please call us at 866-848-8896 or fill out our contact us form to speak with an Unclaimed Property Specialist. You can also email us at Questions@KeaneUP.com.